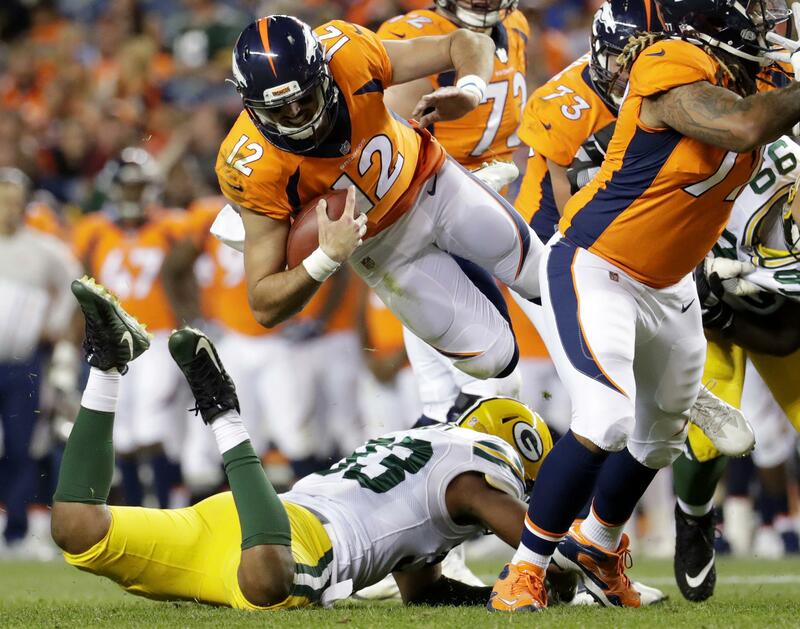 Sat., Aug. 26, 2017, 11:02 p.m.
Jamaal Charles’ impressive Denver debut included four rushes for 27 yards on Saturday night in the Broncos’ 20-17 preseason win over the Green Bay Packers in Denver. Von Miller also made his preseason debut and sacked Aaron Rodgers for an 11-yard loss, forcing the Packers to settle for Mason Crosby’s 52-yard field goal and ending Rodgers’ night. Rodgers was 3 for 5 for 12 yards. Cardinals 24, Falcons 14: John Brown made a strong statement that his lingering quadriceps injury is no concern as he caught two touchdown passes to lead Arizona over host Atlanta. Brown showed off his speed when he caught a 28-yard scoring pass from Carson Palmer and a 21-yarder from Drew Stanton. Ravens 13, Bills 9: Winless Buffalo sent home defensive tackle Marcell Dareus, lost quarterback Tyrod Taylor to injury and made far too many mistakes against host Baltimore, which remained undefeated in the preseason. Though starting quarterback Joe Flacco has yet to take a snap at camp this summer, the Ravens have relied heavily on their retooled defense to win. Colts 19, Steelers 15: Scott Tolzien led a pair of long scoring drives to inch closer to the starting quarterback job for the season opener if Andrew Luck’s shoulder isn’t ready, and the Indianapolis defense kept host Pittsburgh’s high-powered offense in check. Tolzien completed 7 of 10 passes for 123 yards and an interception, including a 55-yard hookup with Donte Moncrief that set up a 1-yard Frank Gore touchdown run. Giants 32, Jets 31: Landon Collins and Donte Deayon scored on interception returns, Jason Pierre-Paul recorded a safety and Eli Manning and the offense showed a little life for the first time this preseason as the Giants turned the annual game for the bragging rights of New York into an early laugher and late thriller in East Rutherford, New Jersey. Browns 13, Bucs 9: Rookie quarterback DeShone Kizer made his first start in Cleveland’s win over Tampa Bay in Tampa, Florida. Playing the entire first half after a pregame downpour, Kizer completed 6 of 18 passes for 93 yards and an interception. Chargers 21, Rams 19: Phillip Rivers capped the game’s opening drive with a 45-yard touchdown pass to Travis Benjamin and Joey Bosa’s strip sack of Jared Goff led to Melvin Ingram’s 76-yard fumble return for a score. The Chargers raced to a 21-0 first-quarter lead and held on to beat the host Rams in the matchup of Los Angeles teams. Saints 13, Texans 0: Starting quarterback Tom Savage struggled to move Houston’s offense. His popular backup, first-round draft choice Deshaun Watson, didn’t do much to distinguish himself, either, in a loss in New Orleans. Darius Victor ran for a 3-yard touchdown and Wil Lutz kicked field goals of 26 and 48 yards for New Orleans, which ended a 10-game preseason skid last week. Cowboys 24, Raiders 20: Ezekiel Elliott had eight touches in 10 plays in his only series of the exhibition season with a looming six-game suspension for domestic violence before undrafted rookie Cooper Rush rallied Dallas with two TD passes to top Oakland in Arlington, Texas. Published: Aug. 26, 2017, 11:02 p.m.